Gold Record accredited (30 000+ copies) hypnosis program to get to sleep and stay asleep easily by Rick Collingwood. Hypnosis fundamentally switches off the conscious mind - the same part of the mind that keeps you awake when you are trying to sleep. At the same time hypnotherapy is a means of communicates directly with your subconscious mind - the same part of your mind that can wake you up intermittently throughout the night so that you do not get your recommended amount of sleep. Therefore this CD will actually help you sleep automatically by switching off your conscious mind and instill triggers to stay asleep throughout the night on a subconscious level. A few months ago I suffered extreme Insomnia for 7 weeks and could not find anything that would help. The only way I could get any sleep was by using sleeping pills from the doctor and if I didn't use sleeping pills I would be lucky to get 3 hours of sleep a night, if any at all. then a friend suggested your Insomnia Cure CD. All I can say is what a life saver this CD was. It's nothing short of a miracle and I cant thank you enough for what this CD has done to my quality of life. I can highly recommend this Cd to anyone who is having trouble sleeping. I would be happy for you to use this as a testimonial on your website or any where you feel like. The reason I am buying these other CDs is that I was given the 'Insomnia Cure' CD. When I first started using it, I just laughed and laughed and thought, 'what a load of hogwash - how ridiculous and what a waste of time and money', especially when he spoke about the 'tomato plant' and 'the conscious mind not knowing what the unconscious mind knows... etc' However, my 'insomnia' was persistent (has been for years) and I was getting desperate again so I decided to give it a 'fair go' as Aussies would say and followed the program correctly and amidst the laughter but really listening, it gradually worked and I sleep better now which is a 'wonder' for me personally. I feel positive that the other CDs will help and can't wait to get them. I just had to get in touch to let you know how much better I am sleeping! In honesty I didn't expect the programme to work but after 7 years of sleep problems I was getting desperate. I did exactly as instructed, after almost 5 weeks my sleep wasn't much better but I kept on. I stopped listening at the end of week 5 (plus the first 10 days so nearly week 7) and since then I have slept each night - it's wonderful! I still wake many nights for the toilet but rather than lie awake for hours as before, I just drop back to sleep and sleep until between 6 and 7 in the morning. I am recommending your CDs to friends, I just hope they will believe me and try it. Truly amazing results for someone like me who was sceptical to say the least. Thank you so much. Just a note to let you know how fabulous your programs are. I have been suffering from insomnia for about seven years or more. I had tried everything including sleeping tablets, valerian, melatonin, acupuncture, naturopathy, homeopathy, allergy treatments, magnetic sleep system, Niagara therapy massage bed - you name it, I have tried it - and all to no avail. My problem was that I could not get to sleep, and if I did happen to get to sleep on the odd occasion, I would then wake up and just lie there all night. Besides being frustrating it was exhausting and everything and everybody in my life suffered. About four weeks ago, I purchased your Beat Insomnia CD and within two weeks I was sleeping soundly every night. I then purchased your Creating Abundance CD, and within one week I had been offered a World Trip, paid for by my workplace. These two CD’s have just been magic. I thoroughly recommend them. I have recently begun using your CD for insomnia, with great results! It is amazing how a good nights sleep can improve the quality of your life. I am interested in speaking with someone on selecting other CD's in the series that might further benefit me. The retail outlet where I purchased the CD, while friendly were unable to help with any inquiries. Their only assistance in the process selection was these are popular. Can you advise where in metro Perth I might get some further assistance with product selection. As soon as I started using the Insomnia Cure my sleeping improved dramatically. Instead of tossing and turning all night and getting about two and a half hours sleep per night several nights per week I am sleeping deeply, and for longer periods of time. It is rare not to have six or seven hours of refreshing sleep each night now. It was nice talking to you this morning. I got a surprise to hear you were in Perth, I thought you were in Brisbane. I work at a Psychiatric Clinic (Osborne Park) and had asked one of our psychologists a few weeks ago if she could recommend someone who did hypnotherapy. I was desperate to find someone to help me with my insomnia. I went to a private psychologist for a couple of sessions and she taped a session for me (which was nothing like your CD’s I can tell you!). I stopped going due to the expense, and then I found my old CD of yours on weight, I think I got that one through mail order a few years ago. I then thought I would try and find out if you had done one on insomnia. I rang Directory Assistance to see if I could get your number and they gave me the Hypnotist Society in Brisbane. (They didn’t know a thing about you, so they said). I was at a complete loss as to what I would do next, and then I rang Crystal Reflections at Hillarys here in Perth, and asked them if they had heard of you. Low and behold they not only did know you, but they had a CD on insomnia. You can imagine how I felt when they gave me a brochure and we could contact you right here in Perth!! I felt like it was Christmas. As I told you this morning we now have seven CD’s in total. Thank you so much for sending me the updated CD on weight control, I look forward to receiving it in the mail. I bought your Insomnia Cd and cant be more happier with it. However there is one bit that I wish you would have left out and that is the end when you click your fingers and tell us to wake up or go back to sleep. I wake up and cant go back to sleep at that point. So I have had to chop that bit off. I have Chronic fatigue Syndrome and wake several times thru the night. I cant go back to sleep without you talking to me. In fact I think I have become addicted to your voice. Because I am 62 I find it difficult to use a portable CD player because I cant see the buttons in the middle of the night on it and the batteries go flat really fast. So I put it on tape recorder but that now has given up the ghost so looks like I might have to get MODERN and get an IPOD. Thanks again for giving me a better quality of life. 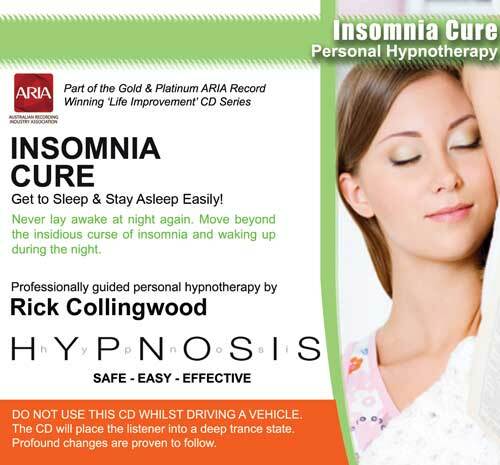 I have been using Rick Collingwood CD for Insomnia with great results after many years of not sleeping. I have been listening to the Insomnia MP3 for a week or so now. I downloaded it just to check it out. I must thank you! I am asleep in no time at all. I think I only recall hearing the bit about the tomato plants once or twice (as I’m usually knocked out by then). you, thank you, thank you!!!! I thinkI can call you dear as you have solved my deprivation of sleep for many months . I was privileged to find your tape cd where I shop and it was terrific I managed 3 hrs in bed the rest I spent on reclining chair as I have been doing these past months . I have many health problems and have been on medication for years . Thankyou for your soothing voice I now have no worries am I going to sleep??? Firstly, thank you for my improved sleep. It’s amazing how quickly it’s working. One question though, can you listen to more than 1 program at a time? As in can I listen to the insomnia cd and the pain free cd over the same period? Well, I feel fine and am doing good. My reaction is somewhat different to what I had expected. At least I feel that I am wide awake during the complete session. I remember every word and am not asleep when the CD is through. After listening to the CD, I then turn around and it takes me a few minutes and I am fast asleep. This already is a huge improvement, since I used to spend hours being tired and trying to sleep. In the morning I wake up rested and positive. That also is a great improvement, only after 5 days listening! I will go on and after a few weeks I will give you another feedback, if you want me to. I had been getting progressively worse in my sleeping patterns over the past 2 and a half years to the point that it would be fantastic if I got 3 hours sleep every other night with some nights no sleep at all. I was barely functioning in my day to day routine. I was having extremely bazaar thoughts and I wouldn’t go to bed at night knowing I wouldn’t be able to sleep. The doctor prescribed light non-addictive sleeping tablets. I did take them but with only taking half I felt hung-over the next day. I was seeing a spiritual healer and put me onto your CD. I was skeptical about hypnosis but was desperate to get off the sleeping tablets so I gave it a go because I had nothing to loose. It did take a couple of weeks to really kick in but now I sleep better than I did before my problem started and wake up feeling awake and not just rolling out of bed. I stopped taking the sleeping tablet within 3 days of starting the program. I am almost at the end of the required period but am feeling fantastic. Now I feel like I’m alive and can motivate myself to do more during the day. I cannot praise Rick Collingwood’s CD enough. I thank you and my girlfriend for the referral. As result of my lack of energy I now have a lot of weight to loose and my blood pressured has gone through the roof. I have to loose 12 kg in an attempt to reduce my blood pressure. I have just ordered the Weight Loss CD and the Mind Body Healing. I have 30 kg to loose and I will let you know how I go. Like a lot of people, I have tried a lot of different diets but to no avail at keeping the weight off. My Naturopath has had me on very strict diets and has told me it may be psychological and to try hypnotherapy. That will start in 2 weeks time when I have finished the Insomnia CD. If it works half as well as the Insomnia CD I will be an extremely happy person. Look forward to singing your praises again!!! !